Looking for a team-building volunteer opportunity nearby in St. Paul for your company, school or other group? Frogtown Farm hosts volunteer groups on a limited basis during the growing season (April through October) for 2-3 hour Field Experiences on weekdays. 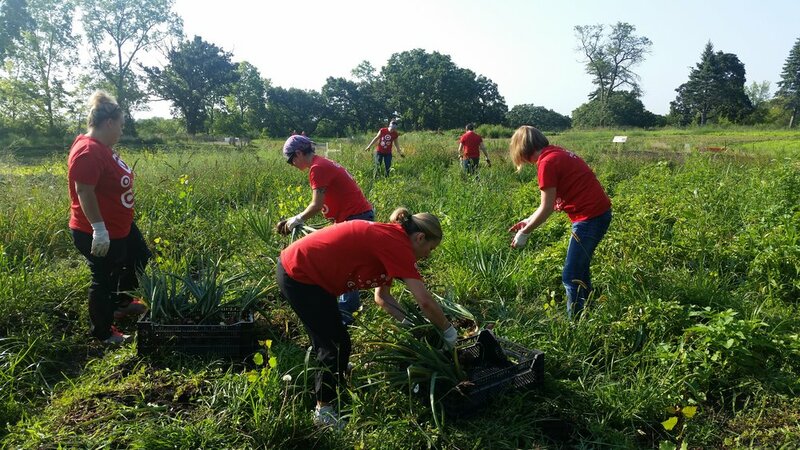 During a Field Experience, volunteer groups may find themselves preparing and planting beds, building compost piles, tending perennial crops like asparagus, mulching to conserve water and protect plants from disease, weeding, harvesting, and even preparing for community events. Spending time on our farm offers a unique team-building opportunity for your group. Frogtown Farm also has outdoor meeting and eating spaces that can be made available for groups to facilitate gatherings before or after your Field Experience. Cost for your groups will vary depending on your group size and the amenities you are requesting. General information is provided below, but feel free to call us with further inquiries. We are offering 2-3 hour field experiences for schools, non-profits, corporations or other groups of up to 40 people. Please contact us to discuss your field day, including the options of food catering, tours, and meeting space. Your field experience and financial contribution support our organic farm production and community programming for Frogtown residents. We are sometimes able to accommodate non-profit and school groups for no fee due to the generosity of corporate groups and other donors. If you are unable to pay, please let us know when you fill out the form. Field experiences are only available in non-winter months (April-October) during the work day. If your group is interested, please click the link below! If you have questions, please contact us at info@frogtownfarm.org or (651) 600-3414. Your group’s team-building volunteer opportunity will advance the important work of Frogtown Farm!